"Now, turn it on, and let's see what happens." That terrifying scream. The frigid breath. The sometimes laser eyes. All those characteristics and more define Godzilla, the original kaiju and King of Monsters. His work is never done--especially when portals open to other worlds where monsters even bigger than he lives. IDW Publishing pitches that scenario in Godzilla Oblivion #1. The issue is written by Joshua Fialkov, illustrated by Brian Churilla and colored by Jay Fotos. The majority of the issue is something of a whirlwind as it follows Doctor Talbert and his unassuming crew into a new world through a portal created at the behest of a corporation. The amount of monsters in Godzilla Oblivion #1 plays like a Godzilla's All-Stars, but Fialkov brings them all together in great fashion. The set-up is an homage to a mad scientist story as it essentially brings humanity to Godzilla and his ilk (as opposed to the other way around). There is some reliance on the concept of apex predator in Godzilla Oblivion #1 in that Fialkov pitches that as the primary conflict throughout the issue. Fialkov blends together elements of Godzilla with those of other works that rely on the "big bad" corporation to create a narrative that works pretty well to freshen up the concept of a giant monster terrorizing others. Considering the different monsters in Godzilla Oblivion #1, Churilla does a solid job of giving each one their own distinct look. Some of the characters boast somewhat exaggerated features that give the book the feel of a caricature at times, yet it works. The human characters are all additionally defined by strong cross-hatching and very emotive expressions. The backgrounds are somewhat disparate in comparison to the foreground, but the adventure into the portal successfully reinforces the scorched earth concept that comes with giant monsters wreaking havoc. Fotos' colors are simple in a way that amplifies the scenery through blues, blacks and browns. Godzilla Oblivion #1 is another entry in the franchise that relies on some previous themes while at the same time offering a new take on them. Godzilla doesn't really feature much in the issue, but it's clear his services will be needed by the time it's all said and done. Fialkov flips the script so to speak in bringing a monster into our world through a portal as opposed to having the monster lying dormant (maybe a nod to Pacific Rim). Churilla's illustrations rely on the characters' easily recognizable looks to pit them against one another in knockdown, dragout scenarios. 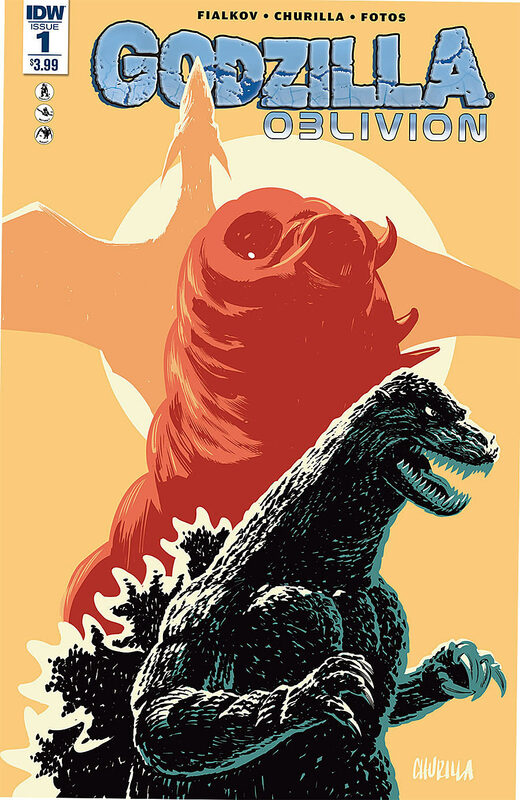 Godzilla Oblivion #1 is definitely something that fans of the franchise will want to check out to immerse themselves in another chapter in the storied monster's life. Godzilla Oblivion #1 is in stores now.